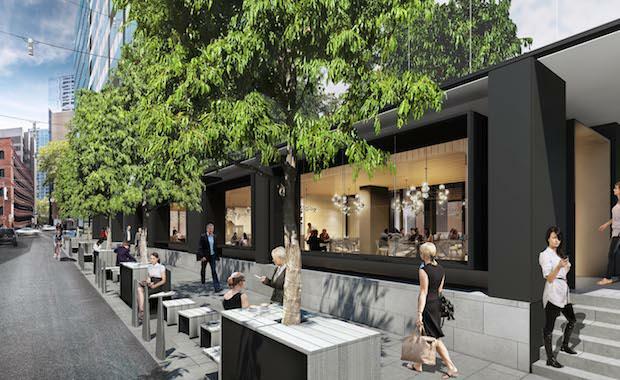 $150 million A-grade office development, 570 Bourke Street, Melbourne, is set to reenergize the city’s quintessential laneway system, re-energising the surrounding streets and creating the city’s newest laneway and dining destination. As part of the construction, Charter Hall is reconfiguring Greshem Street, which backs on to the adjacent Bourke Street, and turning it into a one-way thoroughfare in a bid to make it more pedestrian friendly. It will also add a café with outdoor seating and landscaping designed to increase the site’s connectivity and permeability with its environment, while also allowing employees to connect with the city around them. A total of 670 square metres of retail space will be added to the ground floor fronting Bourke and Little Bourke Streets to activate the surrounding pedestrian friendly street and laneway frontages to further enhance the new building’s Bourke Street lobby. Incorporating Melbourne’s iconic bluestone, the development’s footpaths and entry interpret the precinct’s heritage in a contemporary fashion. The works will see 15,550 square metres of A-grade office space added to the building across levels 2 to 11. A further 170 square metres of boutique office space added to level one, a rebuild of the ground floor lobby and substantial upgrade works to the building services. It now also boasts a 4.5 NABERS rating. Owned by Charter Hall’s Core Plus Office Fund (CPOF), 570 Bourke Street aims to reinvigorate its surroundings and create the amenity tenants across the city crave. said it was vital for property owners to protect and develop Melbourne’s unique laneway spaces to ensure their continued survival as the city landscape develops. “The new laneway aims to enrich this precinct and give people an energised and exciting place to spend time out of the office,” he said. Construction of 570 Bourke Street by Brookfield Multiplex has commenced with completion expected in mid 2015.